* An account of this survey is very clearly given in the ‘United Service Journal’ for January, 1836. Knowing something of the country we have reversed the order of that description, leading our readers from Staines to Silchester, instead of from Silchester to Staines. The line of road presents no place for the chief city of the Attrebates until it arrives at the walls of Silchester. Is this, then, really the Calleva Attrebatum? The distance between Pontes and Calleva, according to the Itinerary [of Antoninus], is twenty-two miles; by the Survey, the distance between Staines and Silchester is twenty-six; a conformity as near as can be required, for neither the length of the Roman mile nor the mode of measuring it agreed precisely with ours.” Having led our readers to the eastern entrance of this ancient city, we will endeavour to describe what he will find there to reward his pilgrimage. Let us tell him, however, that he may reach Silchester by an easier route than over the straight line of the Roman Highway. It is about seven miles from Basingstoke, and ten from Reading; to either of which places he may move rapidly from London, by the South-Western or the Great Western Railway. If we have walked dreamingly along the narrow lanes whose hedge-rows shut out any distant prospect, we may be under the eastern walls of Silchester before we are aware that any remarkable object is in our neighbourhood. We see at length a church, and we ascend a pretty steep bank to reach the churchyard. The churchyard wall is something very different from ordinary walls,—a thick mass of mortar and stone, through which a way seems to have been forced to give room for the little gates that admit us to the region of grassy graves. A quiet spot is this churchyard; and we wonder where the tenants of the sod have come from. There is one sole farm-house near the church; an ancient farm-house with gabled roofs that tell of old days of comfort and hospitality. The church, too, is a building of interest, because of some antiquity; and there are in the churchyard two very ancient Christian tombstones of chivalrous times, when the sword, strange contradiction, was an emblem of the cross. But these are modern things compared with the remains of which we are in search. We pass through the churchyard into an open space, where the farmer’s ricks tell of the abundance of recent cultivation. These may call to our mind the story which Camden has told:—“On the ground whereon this city was built (I speak in Nennius’s words) the emperor Constantius sowed three grains of corn, that no person inhabiting there might ever be poor.” We look around, and we ask the busy thatchers of the ricks where are the old walls; for we can see nothing but extensive corn-fields, bounded by a somewhat higher bank than ordinary,—that bank luxuriant with oak, and ash, and springing underwood. The farm labourers know what we are in search of, and they ask us if we want to buy any coins—for whenever the heavy rains fall they find coins—and they have coins, as they have been told, of Romulus and Remus, and this was a great place a long while ago. It is a tribute to the greatness of the place that to whomsoever we spoke of these walls, and the area within the walls, they called it the city. Here was a city, of one church and one farm-house. The people who went to that church lived a mile or two off in their scattered hamlets. Silence reigned in that city. The ploughs and spades of successive generations had gone over its ruins; but its memory still lived in tradition; it was an object to be venerated. There was something mysterious about this area of a hundred acres, that rendered it very different to the ploughman’s eye from a common hundred acres. Put the plough as deep as he would, manure the land with every care of the unfertile spots, the crop was not like other crops. He knew not that old Leland, three hundred years ago, had written, “There is one strange thing seen there, that in certain parts of the ground within the walls the corn is marvellous fair to the eye, and, ready to show perfecture, it decayeth.” He knew not that a hundred years afterwards another antiquary had written, “The inhabitants of the place told me it had been a constant observation amongst them, that though the soil here is fat and fertile, yet in a sort of baulks that cross one another the corn never grows so thick as in other parts of the field” (Camden). He knew from his own experience, and that was enough, that when the crop came up there were lines and cross lines from one side of the whole area within the walls to the other side, which seemed to tell that where the lines ran the corn would not freely grow. The lines were mapped out about the year 1745. The map is in the King’s Library in the British Museum. The plan which we have given (Fig. 125) does not much vary from the Museum map, which is founded on actual survey. There can be no doubt that the country-people of Camden’s time were right with regard to these “baulks that cross one another.” He says, “Along these they believe the streets of the old city to have run.” Camden tells us further of the country-people, “They very frequently dig up British [Roman] tiles, and great plenty of Roman coins, which they call Onion pennies, from one Onion, whom they foolishly fancy to have been a giant, and an inhabitant of this city.” Speaking of the area within the walls, he says, “By the rubbish and ruins the earth is grown so high, that I could scarcely thrust myself through a passage which they call Onion’s Hole, though I stooped very low.” The fancy of the foolish people about a giant has been borne out by matters of which Camden makes no mention. “Nennius ascribes the foundation of Silchester to Constantius, the son of Constantine the Great. Whatever improvements he might have made in its buildings or defences, I cannot but think it had a much earlier origin: as the chief fastness or forest stronghold of the Segontiaci, it probably existed at the time of Cæsar’s expedition into Britain. 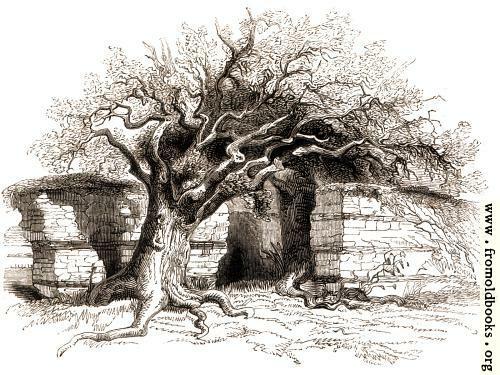 The anonymous geographer of Ravenna gives it a name which I have not yet noticed, Ard-oneon; this is a pure British compound, and may be read Ardal-Onion, the region of Einion, or Onion” (‘Archæologia,’ 1837). It is thus here, as in many other cases, that when learning, despising tradition and common opinion, runs its own little circle, it returns to the point from which it set out, and being inclined to break its bounds, finds the foolish fancies which it has despised not always unsafe, and certainly not uninteresting, guides through a more varied region. 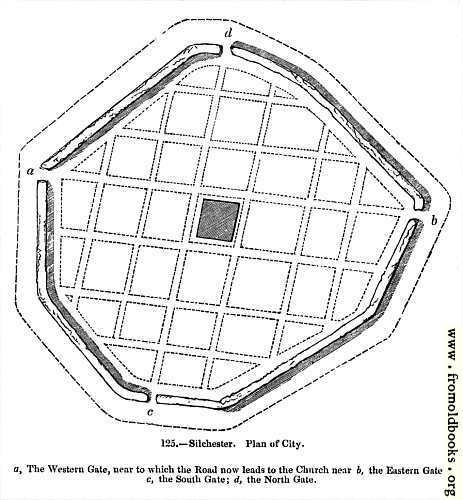 Mr. John Rickman, speaking of Silchester, “the third of British towns in extent,” says, “that the Romanized inhabitants of the last-named town were distinguished by their cultivated taste, is testified by the amphitheatre outside the walls, one of the few undisputed relics of that kind in Britain.” (‘Archæologia,’ vol. xxviii.) Whether the presence of the inhabitants of Silchester at the brutal games of the Romans be any proof of their cultivated taste may be reasonably questioned; but the existence of the amphitheatre is an evidence that the Roman customs were here established, and that the people had become habituated to them. The amphitheatre at Silchester is situated without the walls, to the north-east. There can be no doubt about the form and construction of this relic of antiquity. We stand upon a steep circular bank covered with trees, and descend by its sloping sides into an area of moderate dimensions. Some describers of this place tell us that the seats were ranged in five rows, one above the other. Earlier, and perhaps more accurate observers, doubt whether seats were at all used in these turfy amphitheatres. “It is well known that the Romans originally stood at games, till luxury introduced sitting; and it is observable, that the Castrensian amphitheatres in general preserve no signs of subsellia, or seats; so that the people must have stood on the grassy declivity. I saw no signs of seats in that of Carleon, nor in the more perfect one near Dorchester, as Stukeley has also observed. Nor do I recollect that any such have been discovered in any other Castrensian amphitheatre, at least in our island, where they seem to have been rather numerous.” (Mr. Strange, in ’Archæologia,’ vol. v.) The very perfect amphitheatre at Dorchester is much larger than that of Silchester, Stukeley having computed that it was capable of containing twenty-three thousand people. The form, however, of both amphitheatres is precisely similar (Fig. 126). Their construction was different. The bank of the amphitheatre at Silchester is composed of clay and gravel; that at Dorchester of blocks of solid chalk. These were rude structures compared with the amphitheatres of those provinces of Rome which had become completely Romanized. Where the vast buildings of this description were finished with architectural magnificence, the most luxurious accommodation was provided for all ranks of the people. Greece and Britain exhibit no remains of these grander amphitheatres, such as are found at Nismes and at Verona. 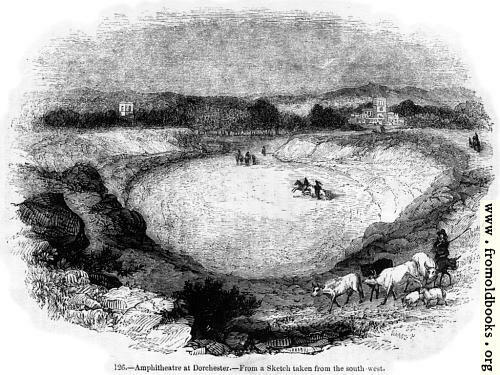 The amphitheatre of Pompeii, though of larger dimensions than the largest in England, Dorchester, appears to have been constructed upon nearly the same plan as that (Fig. 128). Some bas-reliefs found at Pompeii indicate the nature of the amusements that once made the woods of Silchester ring with the howlings of infuriated beasts and the shouts of barbarous men (Fig. 127).